← 228 "Brother's Little Helper"
The Simpsons sit down as normal. Marge notices the name “Matt Groening” written on the carpet, gets up, and wipes the name off. A caricature of Matt Groening (wearing a tacky orange and yellow Hawaiian shirt) comes in and rewrites his name on the floor. "I am not the Last Don"
"Guess Who's Coming to Criticize Dinner?" is the third episode of season 11. It originally aired on October 24, 1999. The episode was written by Al Jean and was directed by Nancy Kruse. Ed Asner guest stars as the Lifeways Editor. "Homer gets the perfect side job when he becomes the chief restaurant critic for The Springfield Shopper newspaper. He loves the perks, but can barely write a complete sentence. When Lisa helps out by ghosting his columns, Homer becomes the most powerful—and feared—critic in town. Soon Homer earns the wrath of every restaurant owner in Springfield and they join together in a plot to kill him with a poisonous éclair. Can Homer survive this death by chocolate (and butter, and custard)?" The kids of Springfield Elementary School take a trip to The Springfield Shopper headquarters. Homer is accompanying Bart and Lisa on the tour, but wanders off on his own when he smells food, and ends up crashing the newspaper food critic's retirement party. Homer eats the food at the party and sings a song about it; the editor is so impressed he hires Homer to be a food critic. Homer starts by writing an example review on the typewriter, but it's terrible. Lisa decides to help - She takes the nonsense Homer dictates to her and translates it into eloquent reviews, typing them up on her computer then giving them to Homer to send in (just like Bart and Lisa did with Grandpa in "The Front"). 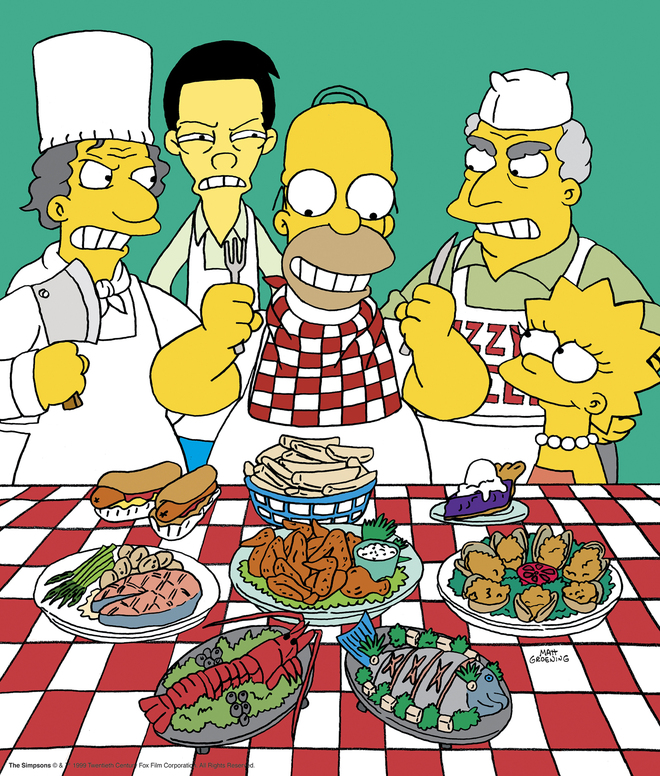 Homer gives all the restaurants good reviews, resulting in a massive surge in obesity of town residents including Ned and Maude Flanders, Lenny, Otto, Sideshow Mel and Mr. Burns (whose shins break under his new weight). He later talks to his fellow critics who say they sometimes have to give bad reviews. Homer being how he is takes this too seriously and gives every restaurant (and Marge) bad reviews. An angry Lisa quits ghost writing for Homer, while his unjust reviews anger every restaurant owner in Springfield, making them want to kill him. Their plan is that a French chef/assassin will bake a poison éclair for Homer, who will eat it once he reaches the man's stand at an upcoming eat-off event. When the day comes, during the competition, Bart overhears the chefs talking about their plot and informs Marge and Lisa. Homer sees the éclair, but Lisa tells him it is going to kill him. Homer declares he would rather die than not eat the pastry, but then Lisa says it is low fat. Homer screams in horror and drops it into Hans Moleman's gruel, then destroys the eat-off, and everyone chases him. Modified on July 7, 2016, at 12:32.